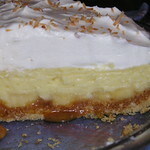 Banana-Caramel Coconut Cream Pie - Do You Know The Muffin Man? 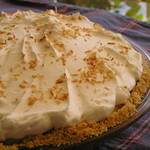 I like to bake and make desserts in my spare time. This is a journal of my experiments. Filling looked lumpy. Strong coconut flavour (Aroy-D makes thick coconut milk). Caramel too runny and cloying. Crust holds up well. Deteriorates rapidly after second day. © 2005 - 2019 by Eric Fung.